We have a number of items for sale, or available for you to buy, or to sell at fundraising events. 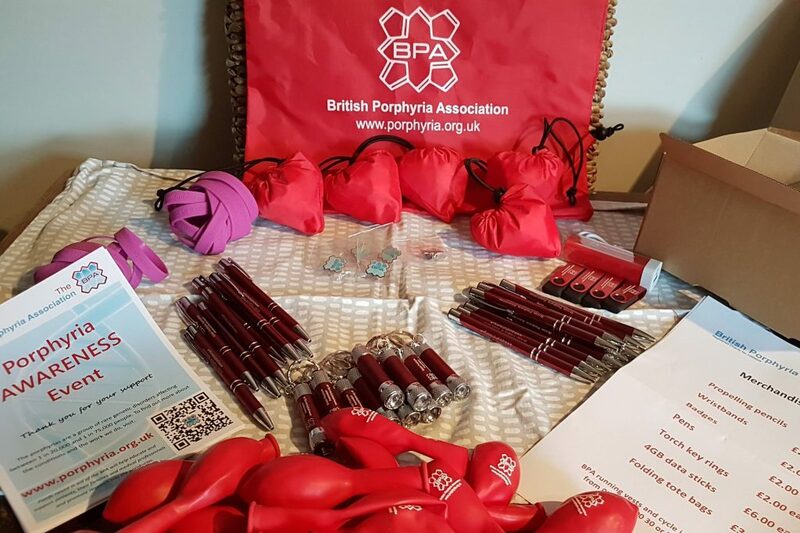 We are happy to provide you with a merchandise pack and display box if you would like to sell merchandise for us, for example at a school fete. We ask for a deposit of £20 to obtain one of these kits as the merchandise within it will be valued at around £150. You can then sell the merchandise at your event on a sale or return basis, and send us the remaining merchandise and the proceeds (less your deposit) at the end. Sports quality runninng vests and cycle jerseys available on request. If you are taking part in a fundraising event or require larger numbers, please contact us at: helpline@porphyria.org or on 0300 30 200 30.